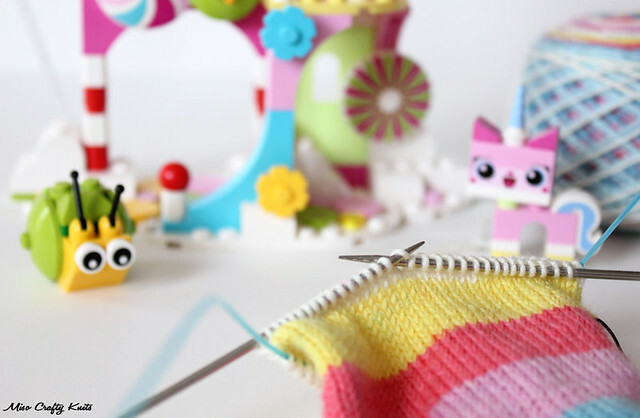 I'll give you some forewarning right now: all photos regarding this project - the yarn, the knitting of, the progress, everything will always contain a Unikitty minifigure and maybe (but most likely) Cloud Cuckoo Palace. Just a forewarning. But can you blame me? Unikitty is pure amazeballs. And just look at how fun Cloud Cuckoo Palace is! Can that snail be any cuter?!? 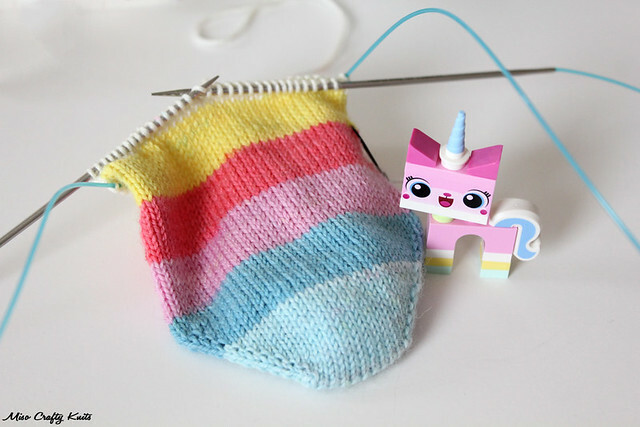 And this yarn...these socks...this entire project...it all just goes hand in hand with all things Unikitty. Cause well, everything is awesome!! I think I get too overly excited talking and even thinking about this project!! Yeah, I have that song stuck in my head pretty much all the time. It sure doesn't help that my kidlet wants to listen to the song on a daily basis. On repeat. Luckily for me I don't mind the song at all. And despite the amount of times I've listened to the song, I still find The Lonely Island's rap bit hilarious. I love Andy Samberg! Anyways, about the socks. I'm knitting them toe-up, as I usually do when I knit with self-striping yarns, using my go-to plain vanilla sock recipe. I thought about using the fish lips kiss heel for these, as I've been seriously dying to try this technique out for quite a while now but I couldn't get over the idea that the stripes might not be equal on top of the foot. I'm weird like that. I like my stripes to be somewhat even. None of that fat stripes with one tiny little line of a colour thrown in there. No thanks. Unless that's the way it's suppose to stripe. Then maybe I can deal. 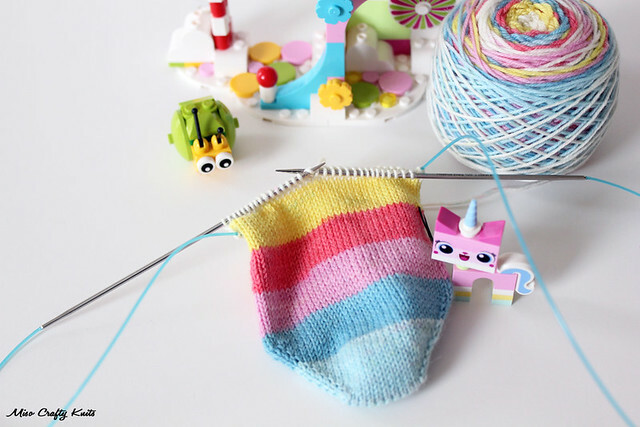 I think I'll give the fish lips kiss heel a try on another pair of socks that aren't self-striping. For now, I'm going to stick with the afterthought heel (I've used this tutorial when I first started knitting this heel). I'm using one skein per sock and plan on using up every last inch of this yarn. The length of the leg might be a little awkward and weird, but I don't care if they end up slouching a bit from being too long on my short legs. I'm not about to let a single inch of this yarn go to waste! I know I said this about the Hudson socks too, but I'm going to be one sad little kitty when this pair is finished. It's such a fun colourway, perfect for this time of year too, and who doesn't get a kick out of knitting with self-striping yarn in general? Luckily I've got my hands full with knitting for the kiddo's fundraiser, so it'll be a while before I can finish these socks. I honestly don't mind admiring them as they sit in my knitting basket. 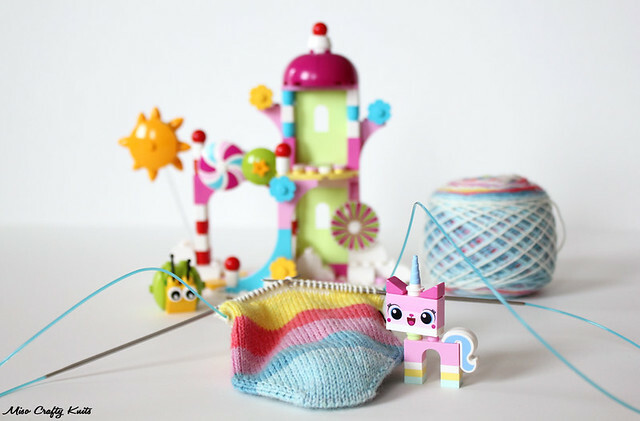 But when I do get the chance to knit on them, you can bet I'll be Instagraming the craptarts out of them! That yarn is amazing! Loving the colours. Oooo so awesome! I have to show my boys your socks. They were pretty excited about the yarn!